The first signs of spring. I also spotted a couple of daffodils nearly ready to burst into flower yesterday. I saw the snow drops too, yesterday! So thanks for the nice image. Spring can`t be that far away. I saw some in a Victorian cemetery here in Yorkshire a few miles from where I live about 10 days back but slipped on putting photo up. Its always good to see these first flowers when nature comes back to life. 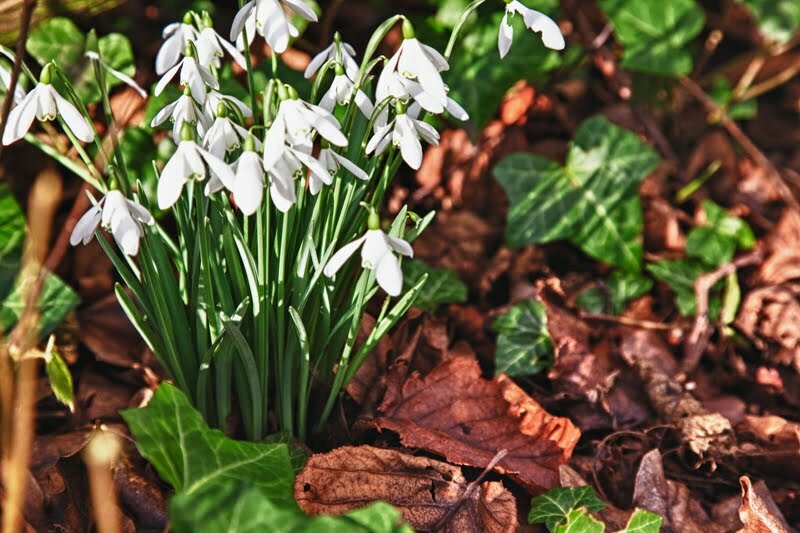 Beautiful snowdrops! I saw a carpet of them under trees the other day - lovely. I remember one trip I took to London in March and there were daffodils and these beauties everywhere. The parks looked so colorful. I have some in my garden. I was thinking of posting them tomorrow. Havent' seen any around here yet, but it's good to know that they're starting sprouting out. Ciao. A. No way, so early? We're at least a month if not two away from snowdrops and daffodils in Montreal...or anywhere else in Canada except for British Colombia!!! Thanks for sharing the picture though, it gives me hope in believing that Spring really can't be too far off and will be here before I know it! I saw a few the other day but I didn't get chance to snap them. There are catkins here too. How lovely. The light in this photoi is just beautiful. I hope spring isn't too far away. Today I spotted the first ones in my front garden, peeping out from under a bush. Thanks for a cheerful photo Mo. I'm so jealous! Lovely shot. Spring clearly comes early to you! Enjoy it.